NOW, THEREFORE, given the prolonged and continuing duration of this natural gas leak and the request by residents and local officials for a declaration of emergency, I, EDMUND G. BROWN JR., Governor of the State of California, in accordance with the authority vested in me by the State Constitution and statutes, including the California Emergency Services Act, HEREBY PROCLAIM A STATE OF EMERGENCY to exist in Los Angeles County due to this natural gas leak. 1. All agencies of state government shall utilize all necessary state personnel, equipment, and facilities to ensure a continuous and thorough response to this incident, as directed by the Governor’s Office of Emergency Services and the State Emergency Plan. 2. The Governor’s Office of Emergency Services, in exercising its responsibility to coordinate relevant state agencies, shall provide frequent and timely updates to residents affected by the natural gas leak and the appropriate local officials, including convening community meetings. 3. The California Public Utilities Commission and the California Energy Commission shall take all actions necessary to ensure that Southern California Gas Company maximizes daily withdrawals of natural gas from the Aliso Canyon Storage Facility for use or storage elsewhere. 4. The Division of Oil, Gas and Geothermal Resources shall direct Southern California Gas Company to take any and all viable and safe actions to capture leaking gas and odorants while relief wells are being completed. 5. The Division of Oil, Gas and Geothermal Resources shall require Southern California Gas Company to identify how it will stop the gas leak if pumping materials through relief wells fails to close the leaking well, or if the existing leak worsens. 6. The Division shall take necessary steps to ensure that the proposals identified by Southern California Gas Company pursuant to Directives 4 and 5 are evaluated by the panel of subject matter experts the Division has convened from the Lawrence Berkeley, Lawrence Livermore, and Sandia National Laboratories to evaluate Southern California Gas Company’s actions. 7. The Division of Oil, Gas, and Geothermal Resources shall continue its prohibition against Southern California Gas Company injecting any gas into the Aliso Canyon Storage Facility until a comprehensive review, utilizing independent experts, of the safety of the storage wells and the air quality of the surrounding community is completed. 8. The California Air Resources Board, in coordination with other agencies, shall expand its real-time monitoring of emissions in the community and continue providing frequent, publicly accessible updates on local air quality. 9. The Office of Environmental Health Hazard Assessment shall convene an independent panel of scientific and medical experts to review public health concerns stemming from the gas leak and evaluate whether additional measures are needed to protect public health beyond those already put in place. 10. The California Public Utilities Commission and the California Energy Commission, in coordination with the California Independent System Operator, shall take all actions necessary to ensure the continued reliability of natural gas and electricity supplies in the coming months during the moratorium on gas injections into the Aliso Canyon Storage Facility. 11. The California Public Utilities Commission shall ensure that Southern California Gas Company cover costs related to the natural gas leak and its response, while protecting ratepayers. 12. The California Air Resources Board, in consultation with appropriate state agencies, shall develop a program to fully mitigate the leak’s emissions of methane by March 31, 2016. This mitigation program shall be funded by the Southern California Gas Company, be limited to projects in California, and prioritize projects that reduce short-lived climate pollutants. a. Require at least a daily inspection of gas storage well heads, using gas leak detection technology such as infrared imaging. b. Require ongoing verification of the mechanical integrity of all gas storage wells. c. Require ongoing measurement of annular gas pressure or annular gas flow within wells. d. Require regular testing of all safety valves used in wells. e. Establish minimum and maximum pressure limits for each gas storage facility in the state. f. Require each storage facility to establish a comprehensive risk management plan that evaluates and prepares for risks at each facility, including corrosion potential of pipes and equipment. 14. The Division of Oil, Gas and Geothermal Resources, the California Public Utilities Commission, the California Air Resources Board and the California Energy Commission shall submit to the Governor’s Office a report that assesses the long-term viability of natural gas storage facilities in California. The report should address operational safety and potential health risks, methane emissions, supply reliability for gas and electricity demand in California, and the role of storage facilities and natural gas infrastructure in the State’s long-term greenhouse gas reduction strategies. This report shall be submitted within six months after the completion of the investigation of the cause of the natural gas well leak in the Aliso Canyon Storage Facility. I FURTHER DIRECT that as soon as hereafter possible, this proclamation be filed in the Office of the Secretary of State and that widespread publicity and notice be given of this proclamation. IN WITNESS WHEREOF I have hereunto set my hand and caused the Great Seal of the State of California to be affixed this 6th day of January 2016. M.I.A. 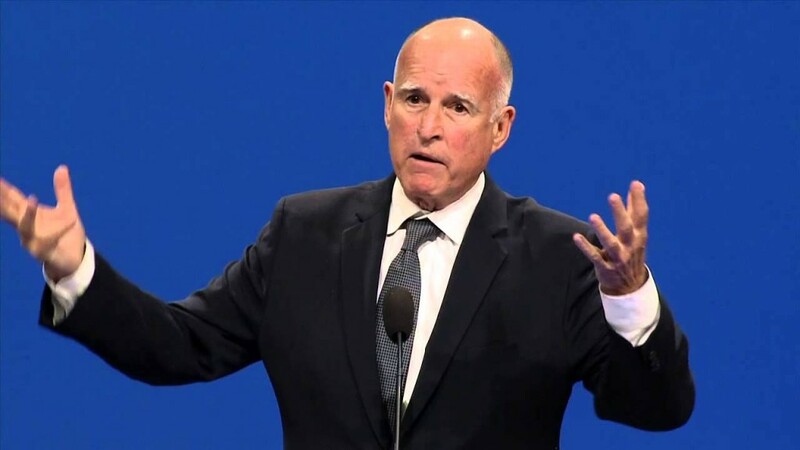 – Where Is Jerry Brown? The growing concern over the massive leak of methane gas and other harmful chemicals at the Aliso Canyon facility of the Southern California Gas Company has become urgent. The methane, leaking since at least late October of 2015 constitutes a dire threat to global warning, pumping an estimated 55,000 kilos of methane into the atmosphere every hour. Calls for Governor Brown to declare a State of Emergency have gone silent. Recently, at a mass-meeting of residents at a Porter Ranch church, Attorney Robert F. Kennedy, Jr publicly called for Gov. Brown to declare a State of Emergency in the area, and begin evacuations of the population until the dangerous leak is stopped. Kennedy, with other attorneys, are in the process of filing lawsuits against the Gas Company. He challenged Gov. Brown, a fellow Democrat, to come out of hiding and declare the area a disaster. He questioned that Brown’s continued silence could be because he takes a lot of money from the oil and gas industry? Or is it because his sister, Kathleen Brown, sits on the Board of Sempra Energy, the parent company to the Gas Company? Kennedy and others want the entire Aliso facility shut down for safety concerns. This call for the complete shut-down of the gas injection facility could have far reaching implications. The Gas Company uses a geologic formation deep beneath the earth to store the gas, where it is injected under tremendous pressure and compressed so that a lot of gas can be stored there. There is usually something like 85 billion cubic feet of gas pumped into the formation. From there, pipelines carry the gas all over Southern California, from Bakersfield to San Diego, where the population depends on gas for heating, hot water, and cooking. Closing the facility without some form of replacement, could be life-threatening or at the least life-changing for millions of Californians. The magic of turning on your stove to heat up your dinner, or take a hot shower, or be warm on a cold night would be gone. The use of these underground geologic caves and domes goes back to the days of World War 2. The United States War Department used these formations to store gas to keep it below the surface in case of air attacks from the Japanese Empire. After the war, the U.S. War Department “transferred” their rights to the Gas Company for the dome under Playa Vista. The problem is that it was never legally and full permitted and processed by relevant authorities on the State level, meaning that since the war, all this has been basically illegal, or at best in a “grey area” of legality. These geologic formations were places that oil had been pumped out, leaving a sort of empty cavern that the War Department and then the Gas Company thought would be fine for the storage of natural gas. There are many problematic questions about this that have never been answered. The first question is regarding these caverns. It was long assumed and propagandized to the public that oil comes from the decay of dead dinosaurs. Some oil companies, like the old Sinclair Oil Company actually used replicas of dinosaurs in their advertising. New theories, however, claim that the creation of oil is “abiotic”, and is continuous, a result of various chemicals and minerals deep in the earth that are continuously going through a process under tremendous heat and pressure that is creating oil and gas. This would explain why some oil wells that are “worked out”, suddenly become active again. If this theory is indeed true, then new oil would be seeping back into the old wells. As we know, some of the chemicals in oil are extremely hazardous to human health. Some areas of Southern California are still full of working oil fields. The area was, and continues to be, a bonanza of wealth for the oil companies. Thousands of wells were punched into the landscape on the west side of Los Angeles. Venice, the Marina area, even Beverly Hills had hundreds of them. Many of the old ones were not properly capped off, and were just abandoned, or capped with old technology that would be illegal today. This lets oil and gas to percolate through the area, sometimes causing death and destruction. At the top menu bar on this website you can view our 4 part documentary series on the entire history of oil and gas in Southern California, going back to the days of the Spanish colonial period. It covers the drama and the deadly consequences of pumping oil in an urban environment, and how various authorities, including the State of California and the City and County of Los Angeles have turned a blind eye to the problems, and have allowed illegal and non-permitted wells, have approved massive apartment and condo projects without E.I.R. filings, and have put a large part of the population in danger of their lives. In our Documentary series you will see the big Playa Vista blow-out, where a huge flame a hundred feet to two hundred feet high blew from their other injection facility on the West side of Los Angeles. The Playa Vista area has another one of the underground caverns where gas is pressurized, but when things aren’t done right, the blast can be seen for miles. Could the methane leak explode at Porter Ranch? Yes, of course it could. It is so dangerous that the crews cannot work at night because the lights and generators could spark a massive methane explosion. The F.A.A. has already banned any aircraft from flying over the area, due to the potential of an explosion. A video recently posted on youtube shows an infra-red video of the gas leak (methane is odorless and colorless so a regular camera cannot view it). It will shock you to see just how much methane is pouring out, it looks like a volcano of methane. Remember that this has been going on at least since October 25th. Many are now calling for the complete mandatory evacuation of the Porter Ranch area. This is due to several factors. First, of course, is the possibility of a huge methane explosion, that could literally take out a big part of the area. The second problem is from the deadly and dangerous chemicals that are possibly being released along with the methane. A list of cancer-causing chemicals would include benzine, and toluene, and even possibly hydrogen sulfide, which can cause brain-damage and even death. A major worry is that the gas is not just coming up the main pipe, which was sealed at the top. The gas is leaking deep at the 8,000 ft level, and possibly spreading out and coming up from deep below the earth into any area that it can find a path. This could include aquifers and underground water streams, meaning that the water would become poisoned and the gas could travel and pop up somewhere else. This has happened many times before in our recent past. Remember how methane from old oil wells seeped into the basements of department stores in the shopping center at 3rd and Fairfax in the Hollywood area? One spark ignited the methane, which blew up and killed and wounded several people. Methane had seeped under the parking lot and the flames were coming up from cracks in the parking lot. It was like hell was coming to the surface. The schools in Porter Ranch have now been closed by the Los Angeles Board of Education. It took them 2 months, but at least they have done it now. The Gas Company is making a half-hearted effort to voluntarily relocate residents, but the process is flawed because they want you to pay first and then get reimbursed. How about the Gas Company pay hotels or apartments directly? They caused this problem. How can it be expected that a resident, still paying a mortgage on his house, now has to come up with money for a temporary place to live? This story is far from over. The Gas Company estimates that it will take months for them to fix this one well. And that does not make the public rest easy, since there are over 100 more wells in the field. How many of them are up to code? How many do not have complete concrete casings, and have disintegrating pipes due to the corrosion of chemicals like hydrogen sulfide? They need to fix these wells, at their own expense, not through hiking rates. Sempra Energy just moved into their new snazzy 120 million dollar headquarters building in San Diego. We are so happy for them, making so much money that they can afford such luxury for their executives. Meanwhile, the hard-working middle class folks in Porter Ranch are seeing their businesses, their homes, everything they worked so hard for, going up in a cloud of methane gas. It just ain’t right.